An individual error from on-loan Bolton Wanderers goalkeeper Harry Campbell cost Bamber Bridge a deserved point against Lancaster City. Both sides battled it out for 90 minutes and failed to be separated, but as the game entered stoppage time, Campbell fumbled a clearance in the six-yard box and waiting was Matty Poole who stabbed the ball over the line. The defeat leaves Brig eighth in the Evo Stik Division One North. It was a slow start at the Giant Axe, both sides lacked quality in the final third which saw little created and the majority of the opening stages played in the middle of the park. 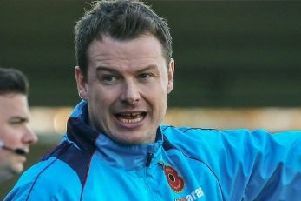 Brig, who were unchanged from Thursday’s away draw at Radcliffe Borough, had the first chance of the game, fullback Matt Mahoney scuffing a shot into the site netting from a Matt Lawlor knock down. Dolly Blues ‘keeper Mike Hale showed great quality claiming two high crosses while Brig shot stopper Campbell remained untested has the first half hour went by. With just five minutes remaining and no shot on target the home side found a break in play and registered the first meaningful chances of the game. The follow up saw striker the nippy Lee Dodgson pick up the ball on the edge of the box but his shot was cleared off the line by former City defender Glenn Steel. The second half saw Brig adopt a much more fluent passing game, the influential Matty Kay and Paul McKenna seeing much more of the ball while the Dolly Blues looked dangerous, breaking several times but failing to test Campbell. On the hour mark, Darren Green replaced Mahoney, and a neat bit of work from the former, saw a Chris Marlow shot deflected wide for a corner. Prior to the Marlow effort, confusion at the back saw Campbell come and then stop for a cross, but with several City strikers lurking in the six-yard box, Lawlor headed the Akrigg cross over the bar. The game continued to open up and Dolly Blues’ fans had their hearts in their mouths when Brig rattled the post. Ally Waddecar showed pace to break on the left, he released StuartVasey down the wing who carried the ball to the byline, his deep cross found Wiles at the back post, who, after cutting inside drilled a left footed effort which struck the inside of the post, the ball then hit ‘keeper Hale before the scrambling Garry Hunter managed to hack the ball off the line. Brig continued to look the more likely to score, with sub Kieron Pickup and McKenna both having efforts on goal blocked. Buoyed by a vocal home crowd, Lancaster rallied late on, skipper Neil Marshall’s deep free-kick was fumbled by on-loan Wanderers ‘keeper Campbell but the latter recovered well to make up for his error. With time running out and a draw looking the likely result an individual error cost Brig a more than deserved point. A cross was sent deep into the box, the ball was loose and Campbell fumbled his clearanceand lurking was Poole, who reacted quickest and stabbed the ball home from two yards to seal the three points.